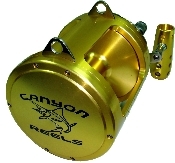 The Canyon EX-30 Trolling Reel is a 30# Class 2 Speed trolling Reel with extreme drag power. The EX-30 Has more power than other 50 lb. class reels right out of the box. The EX-30 allows the fisherman to use a lighter reel for inshore and offshore applications. Easy one touch gear shifter is easy to engage and disengage while in use. The EX-30 can handle fish that are targeted with most 50 lb. class reels, allowing the fisherman to use lighter gear. The EX-30 has an extra loud, extra strong clicker that can be heard from the comfort of your cabin as well. Backed by a 1 year warranty, the EX-30 is an easy choice for the avid fisherman! The EX-30 is built to stand up to the toughest of fish! Extreme Power: A whopping 85 lb. of drag at strike position.